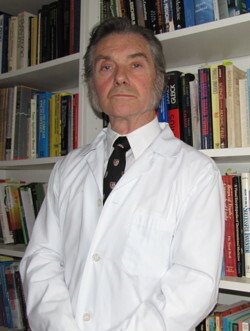 Dr. John Stewart graduated from Glasgow University in Medical Sciences (M.B., Ch.B.) and later earned a Master’s Degree in Biophysics at London University’s Imperial College (the MIT of Europe). He emigrated to Toronto, pursuing a Ph.D. in Neuroscience and later earned a B.Sc in Electronic Engineering at University of Toronto with specialization in circuit design and bio-medical electronics. He is also a doctor of Natural Medicine (DNM) from WONM and has a D.Sc from “Open International University of Alternative Medicine of Sri Lanka (Prof. Dr. Sir Anton Jayasuriya)”. A few of the subjects he has formally studied at university level have been Botany, Herbology, Pharmacology, Zoology, Anthropology, Human Anatomy, Physiology, Physics, Chemistry (Inorganic, Physical, Organic), Biochemistry, Histology/Cytology, Bacteriology, Virology, Pathology, Toxicology, Psychiatry, Psychoanalysis, Neuro-physiology, Statistics, Mathematics, Electronic circuit design, Thermodynamics, Quantum mechanics, Communication Theory, Opto-electronics. Teaching: He was a lecturer in Sensory Neurophysiology at the University of Toronto medical faculty and taught courses on Biomedical Instrumentation at Ottawa, Ryerson and at Waterloo universities. He taught a Pathology course at the Canadian School of Natural Nutrition and Radionics at the Institute of Natural Health Technology and was the original designer in 1998 of the GSR120 bioenergetics device (BIE) for which he holds a joint patent. He currently has a regular TV show at www.thatchannel.com which can be seen on Youtube by searching “Divine Physics”. Memberships: He is a retired member of the British Medical Association, Canadian Medical Association, Association of Professional Engineers, American Association for the Advancement of Science, American and Canadian Holistic Medical Associations, American Academy of Anti-Aging Medicine, World Organization of Natural Medicine, Carl Jung Society, He is a graduate in NLP (Bandler), Reiki, EST (W. Erhard), Forum, Gestalt (Perls), Primal Therapy (Janov), Psycholytic Therapy (Stan Grof), Jungian and Freudian Psychoanalysis and is a certified Reiki master (Usui). Experience: He was a reviewer on Alternative Medicine for the Canadian Medical Association Journal and has published many articles including his review of “Consciousness and Quantum Physics” published in the Journal for Frontier Sciences (Vol 5, 1, 1995). In his earlier years, to pay for his postgraduate studies, he was an attending physician at a geriatric hospital and was Emergency Room physician at York-Finch General Hospital and a psychiatrist-in-training at Toronto General Hospital. He was for 10 years a federal agent and senior scientist with the Canadian Government’s Health Protection Branch (equivalent of FDA), where he was responsible for the approval of medical devices. He also was founder and medical director of one of Canada’s first Holistic Wellness clinics, for which he was well persecuted at that time (1987) when there was great regulatory opposition to Alternative Medicine. As president of Biophysica, he acts as a consultant for medical device manufacturers and invents health and Bioenergetic energy products. His current research is focused on Water Purification, Trans-Cerebral Electro-Magnetic Stimulation (TMS) to activate and enhance Pineal function for Longevity and Savant abilities. Recreation: John enjoys power boating around the thousand islands of Georgian Bay (Parry Sound), picnicking, scuba and water skiing. He was a certified water-ski instructor on Loch Lomond. John is also a retired teenage concert pianist and later played piano in a university jazz band. He is currently learning to play Bach’s Toccata and Fuge in G minor, Rachmaninoff prelude c sharp minor, “As Time Goes By” from Casablanca. He just completed a course on Argentinian Tango Dancing.with “Tango Soul” Studios.